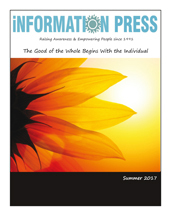 Information Press welcomes article submissions that align with our goal to raise awareness, empower the individual, promote positive personal growth, and support the vision of a sustainable community with a strong local economy. We accept articles on nearly every topic under the sun. All material must be factual and relevant to enhancing life within and on planet earth. Articles speaking to a problematic situation, issue or difficulty must leave the reader with an answer, solution or action that is of a positive nature. All approved articles will appear on line. Due to our limited print space available in each print issue, selected articles will be printed. Suggested length: 300 – 600 words. Longer articles will be considered but may be edited, divided into parts or run as a series. Submission must include a title and one supporting photo or graphic. Information Press reserves final editing rights for all articles it publishes. At the end of each article you may include a short, non-promotional bio about the author. Maximum length is 21 words and can include author’s photo if space allows. No phone numbers, email or website addresses, please. It is OK to mention a business name, city, or book, class or seminar title. Sandra Marshall is the Director of the Illumination Foundation, a center in SLO where meetings, classes and lectures take place. (20). Be creative, come up with your own 21 word bio. General: Topics that raise awareness, stir interest, educate, empower, create community, and inspire but do not promote the writer, a business, product, event, person, or organization for the purpose of making money. (Option): Promo Bio: A single paragraph (65 words maximum) placed at the end of an approved article may promote a business, product, service, event, etc. and includes contact details. Basic fee: $75. Additional words are $1.00 each (maximum 100 words). Promotional: A topic from which the author, a business, event, organization, etc. may benefit financially requires an ad placement or exchange equal to the cost of publishing the article. This is based on a per inch rate. Advertorial: An article specifically promoting a product, business, person, event, etc. will be charged by the column inch rate. Photos can be included. An ad is not required. Occasionally, due to current trends and timeliness, last minute submission are accepted. 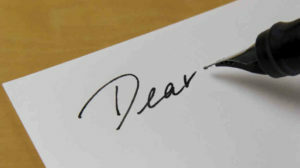 Always submit an inquiry or your article at your earliest convenience. Be sure to include your name, phone number and email address. NOTE: Information Press has final editing rights and is under no obligation to print all submissions BUT we will do our best to do so. Email questions and submissions to sloinfopresseditor@gmail.com. Note in Subject: Article submission and name of author.